Bacon fat—the stuff left in the pan once you’ve got those pork strips nice and crispy—is flavorful as all get-out, not to mention endlessly versatile. Grandma didn’t hoard those jars for nothing. Tossing the dregs in the trash isn’t a good idea, since the grease will wreak havoc on drains, so it’s worth it to figure out a use for it. Now, many people know that you can use it to pop popcorn or grease a sizzling skillet—doing either imbues the finished product with notes of bacon’s smoky porkiness—but we here at The A.V. Club decided to see just how flexible this stuff can be. And we’re not just talking about food (though that’s here, too). How does bacon fat fare in and out of the kitchen? Read on for our discoveries. Oddly enough, the salty, savory flavors of bacon work well with nearly all manner of sweet treats. Bacon fat is often used to create a savory pie crust, though it’s also compatible with handheld snacks. You can fold it into the cream base of these gooey caramels, or use it to brush the doughy skin of sticky buns (as good for dessert as they are breakfast). A process called “fat washing” makes it possible to infuse any kind of alcohol, from bourbon to vodka, with bacon fat. Fat washing is actually pretty simple: After combining the bacon fat with your favorite liquor, let it sit at room temperature for five to six hours, then freeze the mixture for as long as it takes to solidify the fat. Once it’s ready, strain away the solid stuff and take a sip. Smoke fans, especially, will enjoy how the bacon’s essence brings out and enhances the inherent smokiness of scotch and bourbon. Baconnaise is a thing. They even bottle it. But, trust us, it’s better to make your own. It’s easy, too. According to this recipe, all you need to do is combine the bacon fat with canola oil and drizzle it into the finished mayonnaise mixture, adjusting for consistency. Bacon aioli is similarly simple; just be sure to let the bacon fat cool before folding it in with the other ingredients. The salty sweetness brings a rich depth to the aioli without any added heaviness. Vegetables are an essential part of any diet, but greens can be a hard sell for kids or the insatiable carnivore in your life. Here’s a good place to start: Melt a little bacon fat in a skillet with some garlic, then toss in spinach, kale, or collards to temper their bitter, earthy flavors with subtle notes of pork. Rubbing raw bacon fat on your body isn’t likely to do your pores much good, but some basic rendering and a little bit of lye can transform it into a firm, effective soap. Nearly any oil or fat lends itself to the soap-making process, and soaps made from lard possess all-natural properties that result in a firm bar with the ability to both cleanse and moisturize. You can find one recipe here. Some call it a “man-dle.” We don’t, but bacon-fat candles are both a reality and easy to make. 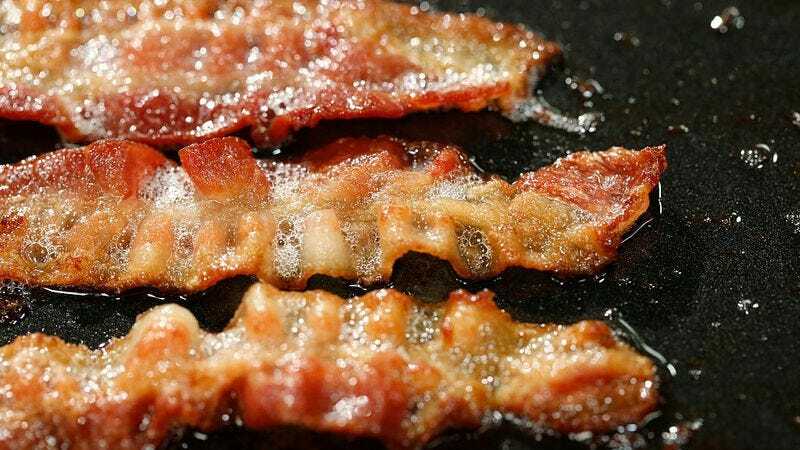 Sure, you’ll need to a cook a ton of bacon to get the right amount of fat (about 4 ounces), but since when has an overabundance of cooked bacon been a bad thing? All you’ll need is a fresh candle wick, a mini mason jar, and the fortitude to not drown in saliva every time you light the thing. Pigs may have a reputation as filthy animals, but a dab of bacon grease has a favorable effect. Use the tiniest bit to add a bright, gleaming shine to scuffed leather boots or dull wallets and purses. Stick to small leather accessories, though, and leave furniture to the professionals. God knows who figured this one out, but bacon fat can actually help you remove a splinter from your skin. Simply dab a little bacon fat to the affected area, then bandage it up. The next day, your skin tissue will have softened enough that removing the splinter with some tweezers will be easy (and relatively painless). Bacon content on Supper Club is brought to you by HORMEL® BLACK LABEL® Bacon.